A new book has been published in Catalonia about narratology and videogames, edited by professor Carlos Scolari, University of Vic. The title is L’homo videoludens. 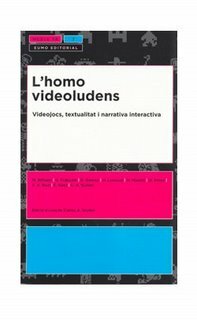 Videojocs, textualitat i narrativa interactiva [Homo videoludens. Videogames, textuality an interactive narrative] The book asks for the definitive constitution of videogame as a research object, from the point of view of narratology and semiotics. Scolari, Carlos (ed.). L’homo videoludens. Videojocs, textualitat i narrativa interactiva. Vic: EUMO, 2008.